Rugby is one of the most challenging sports throughout the entire world. It is considered the forerunner of football in the United States. In fact, some people think of it as a more difficult sport than American football. Of course, this can be debated all day long, but no matter how fans verbally fight about this, it is a fact that Rugby is by far one of the roughest-playing games of all times, with hockey following. You have to be tough to play this game, rain, sun or hail. The game is battled in all types of weather for 90 taxing minutes. What does this mean? It means that players have to be physically fit with the discipline to be prepared for the game and the challenge. This will require long periods of training and preparation. This accessory is also used in training of American Football players. It is a machine used to develop synchronized movement, understand posture, and increase strength in pushing against an object. In this case, the shoulder pads become the opponent and the machine provides the pushing power, helping players to prepare for the game of Rugby. 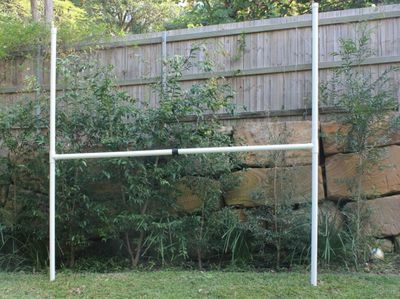 Again, similar to the goal posts used for American football training and game, the rugby goal post has a protective padding to prevent injury in any elevated speed collision of players while in the process of scoring. As a rugby player, you will need your ball bag, which is a largely breathable or ventilated sack, which you can use to carry around more than ten balls. These ball bags are easy to wash and dry. The helmets used by rugby players are made of and padded with soft cushion inside, unlike the hard ones that American footballers have to wear. Of course, you cannot play your rugby game with a ball. This is an important part of the game. There are various kinds of rugby galls to choose from – with a wide range of styles and designs. You will also need a ball pump to fill the ball up with air when needed. Whatever rugby equipment you need, it is important to get them before the holidays so you can enjoy the discount and savings. Stock up on your Rugby Goal Posts or other equipment today. You will be able to practice in your back yard during the holidays when you have friends and family over.